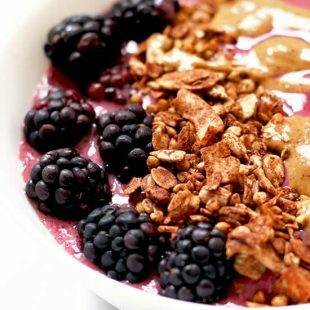 Ever wonder how to make smoothie bowls? 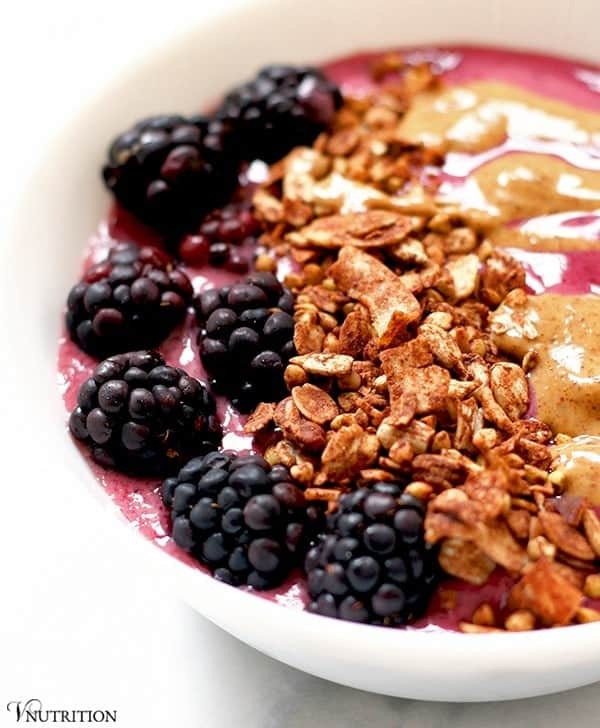 Learn some tips and tricks from a smoothie bowl enthusiast! I have to tell you, I’m obsessed with smoothie bowls. I’ve been making them for the past few years but lately, I’ve been upping my smoothie bowl game. You may have seen some of them on Instagram and I thought I’d share with everyone how to make smoothie bowls just like I do! 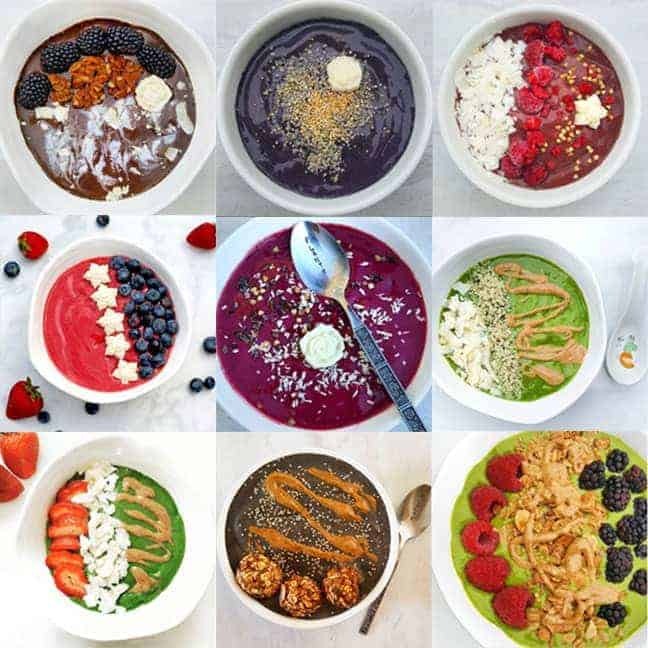 There are so many smoothie bowl ingredients and toppings to choose from, the combinations are endless! 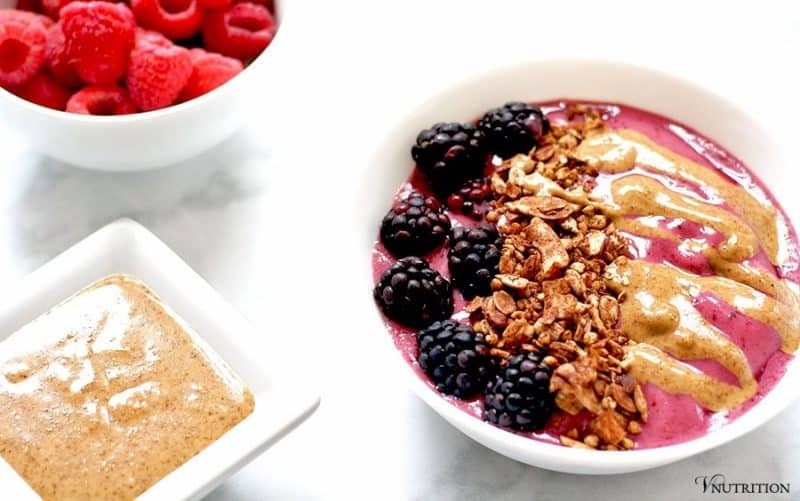 Even though there are many ingredient options, I tend to make smoothie bowls with the same basic recipe shell which include: non-dairy milk, a frozen banana, fruit, and lots of fun toppings. 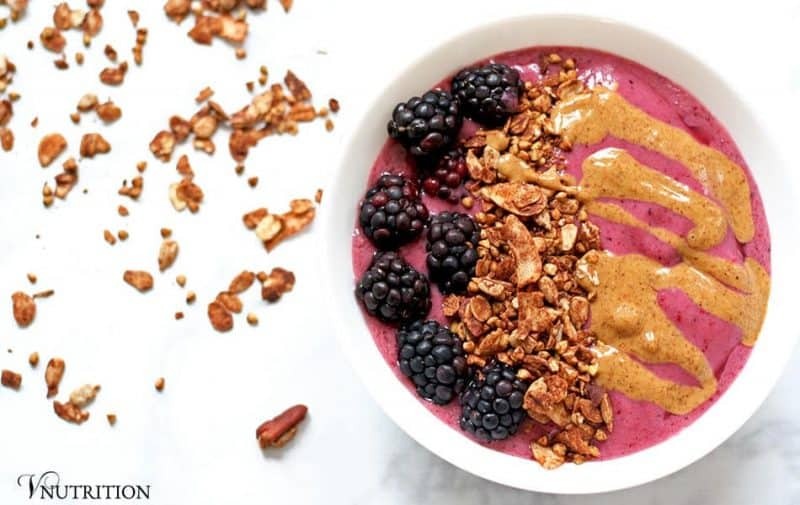 The frozen banana really adds the creaminess that you’re looking for in a smoothie bowl. Because I’m so obsessed with these frozen bananas (and because my husband steals them sometimes) I buy a huge bunch every week. It’s best to let them get spotty before freezing them to they’re at their sweetest. When a fruit is on sale at my grocery store, I stock up on that too. Feel free to use fresh fruit if you have them but I find I like the frozen ones more in smoothie bowls so the consistency is a bit thicker… though I do buy the fresh stuff for topping the bowls. My main fruits are berries such as blueberries, strawberries, raspberries, and blackberries but sometimes especially in the warmer months, I do pineapple, kiwi, and mango. I like to switch things up from time to time with the fruit I choose. For the protein powder, my favorite lately has been Vega but I switch things up sometimes depending on what’s on sale. Many protein powders are expensive so what I’ve been doing is taking a very large tub of Vega, mixing it with another basic protein powder such as hemp or pea and then throwing in some extra cacao powder (if I’m doing a chocolate mix) and some other healthy powders like spirulina, chlorella, and wheat grass. It stretches out the protein powder, saves me some cash, and adds an extra punch of protein. I find that my smoothie bowls fill me up much longer than my regular smoothies because of the toppings. 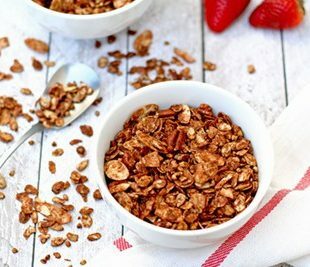 Some of my favorite toppings are fruit, nuts, toasted buckwheat, popped quinoa or amaranth, hemp seeds, my chocolate buckwheat granola, vanilla almond balls, shredded coconut, strawberry chia jam, healthy cereal, chia seeds, and a drizzle of nut butter. I’ve been really loving almond and cashew butter. Toppings (my favorite part!) 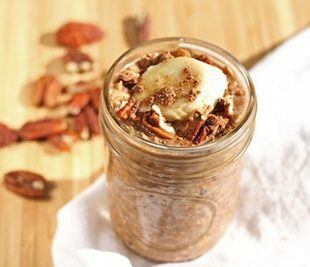 - I love fruit, seeds, nuts, granola, healthy cereal, chia seeds, hemp seeds, coconut flakes, and nut butters. Take a few splashes of milk and blend it with the greens first. For me, this makes the smoothie bowl not as grainy feeling as when I add the greens in with the rest of the ingredients but you can skip this step if you want though. I then add the other ingredients along with the rest of the milk and blend till smooth. Top with any tasty topping you have! I love adding a drizzle of nut butter at the very end - so tasty! 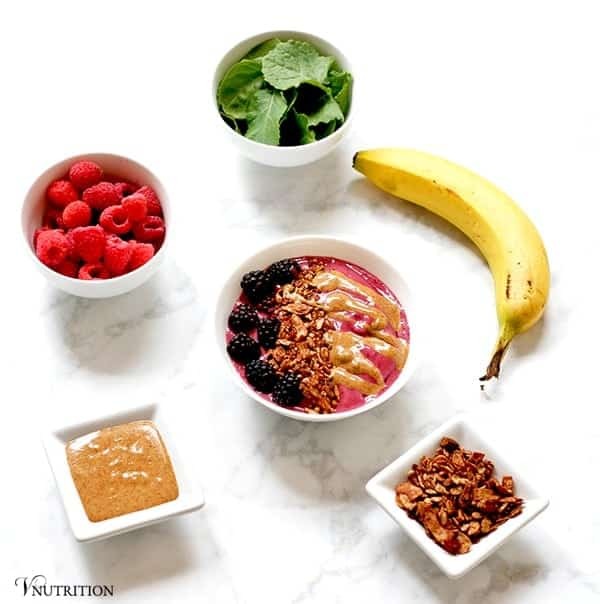 What are some of your favorite smoothie bowl toppings? I love smoothie bowls! They make the perfect breakfast. My favorite toppings are granola, cereal, hemp hearts, chia seeds, or shredded coconut! I totally forgot to put chia seeds on my list! I’ll have to edit my post! My fave toppings: Pecans, walnuts, granola, shredded coconut, chopped strawberries. Yes, I saw Kimmy’s post! Her photos looked amazing – I was very jealous of all the food. Oooh, pecans! I love those! This looks wonderful, thanks for the fun inspiration! Time is a tough issue for me on week mornings, but I think I’ll jazz up my weekend smoothies in a bowl! I started with smoothie bowls just on the weekends too because weekday mornings are so tough. Many times I just make a smoothie in the morning because it’s easier and if I feel like it I can add toppings. Yum, I love smoothie bowls! Yours looks absolutely gorgeous <3 Pinned and shared, thanks for linking up! Thanks Annmarie! Thanks for pinning and sharing! I totally hear what you mean. When I have smoothie bowls it’s much more filling than regular smoothies. Plus the added topping make them more fun too. Very good post! It’s giving me ideas for my future super smoothie bowls! My favorite toppings are granola, chia seeds, hemp seeds, coconut flakes, a bit of maca powder and fresh fruits. I love adding maca powder to my smoothies too! I haven’t had it for a while, thanks for reminding me to pick some more up! Yes, I love that the weather is getting nicer in my area so even more fresh fruit will be available! now that it’s getting warm again I need to make smoothie bowls again. Thanks for linking up! Right there with you I LOVE smoothie bowls! This one looks delicious, I remember seeing it on Instagram! Can’t lie I love it even more because it has my fav protein, Vega, in it! For toppings the options are endless like you said and I switch things up with what I get that week at the store, what needs to be used up, or just opening up the cupboards and fridge and seeing what pops out at me! I too love using frozen fruit to make them thick as well as using nuts, avocado, or soaked chia seeds! I love me some Vega! Yes, avocado is a great addition to keep things thick and creamy! Thanks Sarah! I’ve totally never made a smoothie bowl. Ack! I should probably change that ASAP. Once marathon training starts I’ll have to be much more careful about what I’m eating. Let me know if you try a smoothie bowl. They’re so fun and pretty to make! Good luck with marathon training! This looks so beautiful & delicious! I make smoothies all the time, but have not done a bowl, so looking forward to trying this, thanks for the tips 🙂 Pinned. Thanks Angela! Let me know how you like the bowls! Thanks so much Kimmy! It’s so wonderful to hear that people are liking my posts! I’m so excited to be featured on you HVF! Thanks so much Lauren! It’s warm here today so I actually might have a smoothie bowl for lunch too! Smoothie bowls is always so much fun to make and eat! Thank you for sharing your healthy and delectable Smoothie Bowls with us at the Plant-Based Potluck Party. I’m pinning and sharing. Can you believe I’ve never made a smoothie bowl? I’ve made smoothies a million times over, but they always wind up in a jar. I need to try your tips & topping ideas! I think I make the bowls because I love the topping so much. 🙂 When I don’t have much time though my smoothie goes right in a jar too.